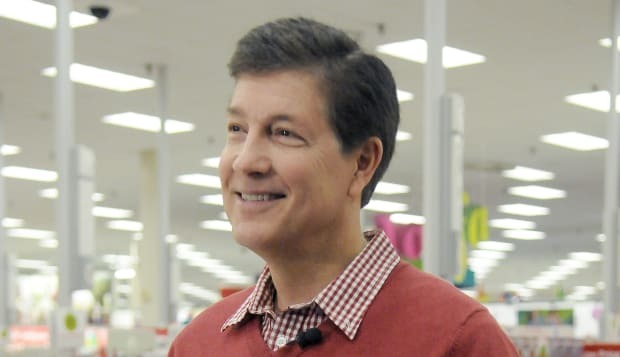 Target President and CEO Gregg Steinhafel resigned Monday in the wake of the retailer's massive data breach, which damaged the company's business and tarnished its image. "Today we are announcing that, after extensive discussions, the board and Gregg Steinhafel have decided that now is the right time for new leadership at Target," a company statement read. Steinhafel, a 35-year veteran of the company and CEO since 2008, also resigned from the board of directors, but will remain in advisory capacity as the company seeks a permanent replacement. For now, Chief Financial Officer John Mulligan has been appointed interim president and CEO. Steinhafel's resignation suggests that the company, the nation's third-largest retailer, is attempting to start fresh as it copes with the fallout of the data breach that found hackers stealing credit and debit card information from 40 million customers. They've since announced a plan to switch to more secure chip-based cards by 2015. Even beyond the breach, it's been a tough year for Target, which has made headlines recently with a discrimination charge and embarrassing website glitch, as well as a broadly criticized anti-union video. "The last several months have tested Target in unprecedented ways," he wrote in a letter to the board of directors, posted on Target's website Monday. "From the beginning, I have been committed to ensuring Target emerges from the data breach a better company, more focused on delivering for our guests." The company also announced the appointment of Bob DeRodes as their new chief information officer, after Beth Jacob resigned from the role in March. Target shares have dropped 2.5 percent since the breach was disclosed. In premarket trading, shares fell $1.06 to $60.95.